I’ve been noticing a theme lately. Everywhere I turn, people aren’t living up to their full potential because they’re letting voices inside their heads stop them from even trying. All these excuses, justifications, and “buts” are doing nothing — only stopping you from seeing results. This kind of thinking is exactly the reason you’re struggling to change your life. Having a defeatist attitude can completely change your ability to achieve your goals. If you think you can’t do something, then there’s a very high chance you won’t do it. Not because you can’t, just because you got in your own way. I just can’t get over that statement — because it’s absolutely true. If we believe we can do something, and we allow that belief to drive us forward and make us take action, then we can achieve anything we want. I’m not saying it’s easy to change how you think. It will take consistent effort and commitment. 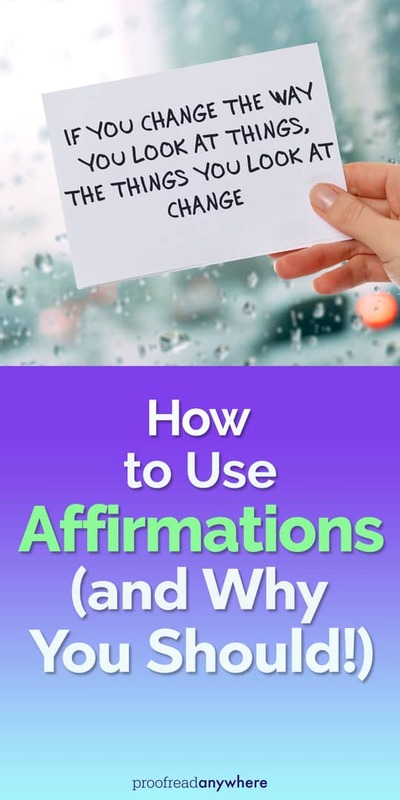 One thing that will help you make the change is using affirmations. 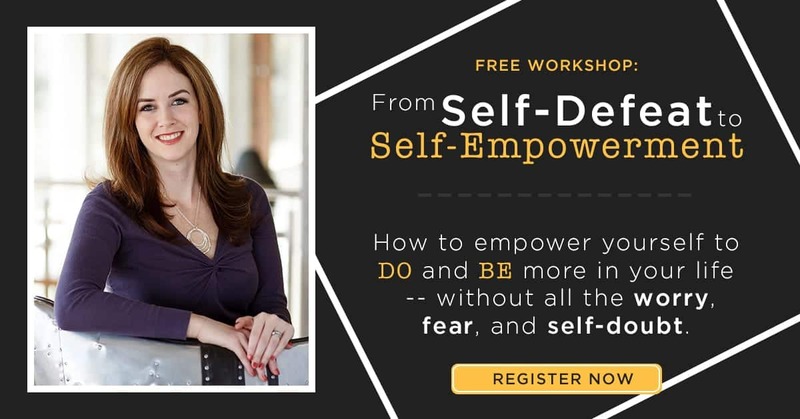 Before you dismiss the idea as too woo-woo for you, let me explain what affirmations are and how they can help you do ANYTHING you want to do. What Are Affirmations and Why Should You Use Them? Affirmations are statements you can use to help you change your thoughts and beliefs from negative to positive. They’re essentially a pep talk you give yourself to boost your confidence and make you ready to take on the world. We hear these messages as kids, but somehow they don’t quite stick in our minds. We let our current circumstances or other people’s opinions determine how our futures will unfold. But that message you learned as a kid is one of the most important messages you’ll ever learn — if you think you can, you will. How about taking it one step further. Commit to the knowledge that you can do anything you want to do with hard work and determination. But you have to BELIEVE you deserve it or you’ll find it difficult to commit to making changes. The first thing you need to do is identify your habitual negative thoughts and commit to changing them. Then you consciously reprogram those negative thoughts by transmuting them into positive ones. The more you’re able to do this, the more your subconscious will work with you toward your goal, and it will give you subtle but powerful momentum in your quest to learn new skills, attract new clients, or anything else you set your focus on. This is called mindset mastery. So what negative thoughts are floating around in your mind, stopping you from making those big changes you desperately want to make in your life? Identify them. Acknowledge them. Then flip them around and turn them into a positive statement. See what I did there? Now, instead of a statement that makes you feel bad, you have one that’ll make you feel pumped to make the changes you need to make. You can write these affirmations on Post-it Notes, on a vision board, or create a screensaver for your laptop or phone. Keep them in a place where you will be constantly reminded of the message you need to hear. Some people swear by doing their affirmations first thing in the morning or last thing at night. Some people like to repeat their affirmations in front of a mirror, looking themselves in the eye. Try different things until you find what works for you. Repeat your positive statement to yourself as often as you need to throughout the day. If you find yourself thinking negative thoughts or doubting your abilities, repeat your affirmation until the feeling subsides. Don’t worry about what other people think. Nobody needs to know what you’re doing! Keep it short. Make it easy to repeat, like a mantra. Keep it positive. A negative affirmation will reinforce negative thoughts. Keep it personal. Write your own affirmation so it resonates with you and helps you focus on your goals. It wouldn’t be like me not to include some tough love here. Yes, you deserve good things. But if you think something’s just going to be handed to you or if you’re not willing to do the work, then you DON’T deserve it! You’re not ENTITLED to these things… but you do DESERVE them if you put in the work. Rather than focusing on how hard it will be, focus on how amazing you will feel once it’s done. Success comes by taking small steps, one day at a time. What negative thoughts are floating around in your mind? It’s time to change your “can’ts” into “cans!” Flip those negative thoughts around and turn them into something positive. Tell me your positive affirmations in the comments!